KIEV, Ukraine -- The crisis in Ukraine appears to have eased slightly in recent weeks. 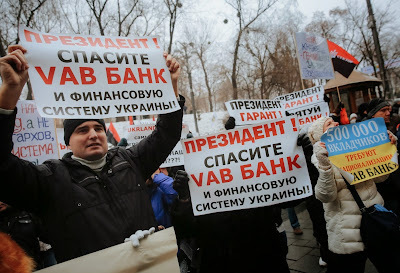 People hold a placards reading 'President save VAB bank and financial system in Ukraine' during a rally against the financial policy of the Ukrainian National Bank in front of the Cabinet of Ministers building in downtown Kiev, Ukraine, 16 December 2014. Fighting between Ukrainian and Russian forces in the eastern provinces of Donetsk and Luhansk has slowed, peace talks will resume this week and Vladi­mir Putin and other senior Russian officials have been mouthing conciliatory rhetoric. Western leaders, suspecting that Moscow’s mounting economic difficulties may incline it to a settlement, have repeated offers to lift sanctions if Russia fully implements cease-fire terms agreed to in September. However, the calm may well reflect only a tactical decision by Putin. Though the ruble has recently plunged and Russia appears headed into a sharp recession, Ukraine is in even worse economic shape. Its currency, the hryvnia, has fallen even more than the ruble, the economy has already contracted by 7 percent and remaining international reserves are sufficient to cover only about six weeks of imports. Putin may calculate that if he simply stands back, the fragile democratic government in Kiev will be destroyed by an economic collapse during the winter. Preventing that implosion will require $15 billion in fresh assistance to Ukraine in 2015, on top of the $17 billion International Monetary Fund bailout arranged this year, according to the European Union. President Petro Poroshenko and Prime Minister Arseniy Yatsenyuk have been pleading for the funds with the European Union, the IMF and the Obama administration. The response has been less than encouraging. An IMF mission left Kiev on Friday without committing to the next payment in the previous bailout program, scheduled for January — much less the $7 billion to $8 billion in additional IMF capital Ukraine needs. Western governments have said additional support must be linked to a credible economic reform program. By most accounts, Mr. Yatsenyuk delivered one this month. It would cut government spending by 10 percent, mandate that gas prices be set at the market price, remove labor and import restrictions and allow the privatization of hundreds of state companies, among other steps. The prime minister’s new cabinet is a technocrat’s dream, with 15 ministers who have not served in previous failed Ukrainian governments — including Natalia Jaresko, a U.S. citizen and highly respected investment banker who has taken over the finance ministry. Mr. Yatsenyuk is now rushing to deliver a budget that begins to implement the reform agenda. The IMF mission will return to Kiev in January for another review. 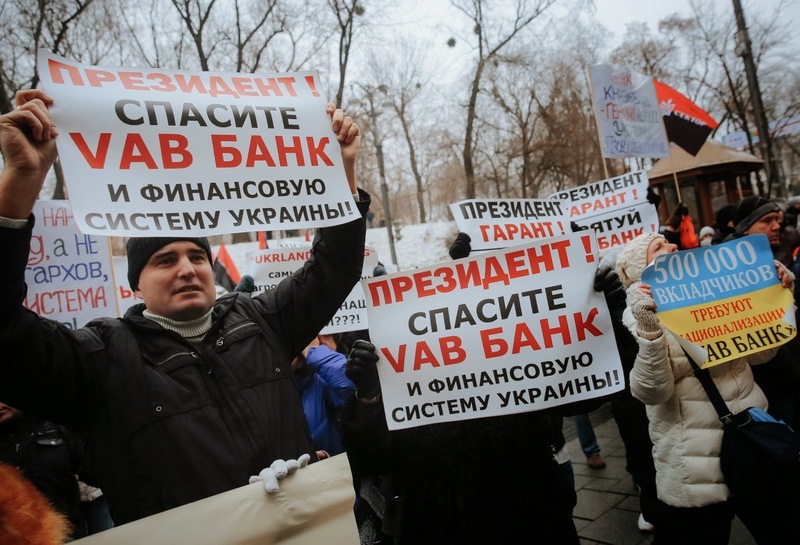 If it does not sign off on additional aid — and if Western governments do not begin to deliver — Ukraine will face default and the collapse of its financial system. That would be a huge win for Russia, which would offer it as proof that Ukraine can only survive as its satellite. Yes, eastern Ukraine is quiet. Putin is waiting to see if Western inconstancy will deliver what his tanks did not. Are there many countries in the world whose economy is NOT "ön the rocks" and NOT living off loans? Russia's economy is only marginally better because it simply takes its God-given natural resources - oil, gas, gold, timber - and sells it. It even needs Western technology and credit to extract those resources . That is hardly an economy that evokes much confidence and, despite Putin's bluster and posturing, is very much on the edge. Very few countries could have survived - as Ukraine has - a rapacious regime that stole everything it could and left the country with huge debts; built up an army from scratch that succeeded in halting Russia's invasion force; held two democratic and honest elections; resolved a months-long energy choke-hold imposed by Gazprom; has seen 10% of its industrial base and a large part of its eastern infrastructure destroyed by a barbarian horde; and is a continuing target for state-supported sabotage and terrorism. At risk of sounding like a teenager in response to the heading "Ükraine's Economy Is On The Rocks And Needs Western Help"........like "da".